Although you cannot see where the fort once stood, reconstructed wooden walls serve as a visual backdrop. A blockhouse similar to structures built in the 1800s was constructed at the southwest corner of the fort wall. 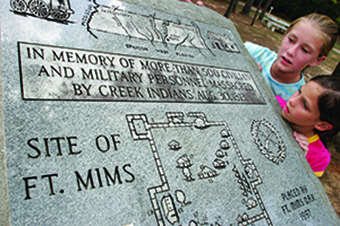 Historical markers and interpretive signs tell the story of the battle. Listed are the family names of those who died and those who survived the attack. A recorded five minute narrative can be heard at the west end of the picnic pavilion. The pavilion and grounds are accessible to individuals with physical disabilities but there are areas of rough terrain. If you have questions, please contact us at 251-533-9024 or claudia_cmpbll@yahoo.com.